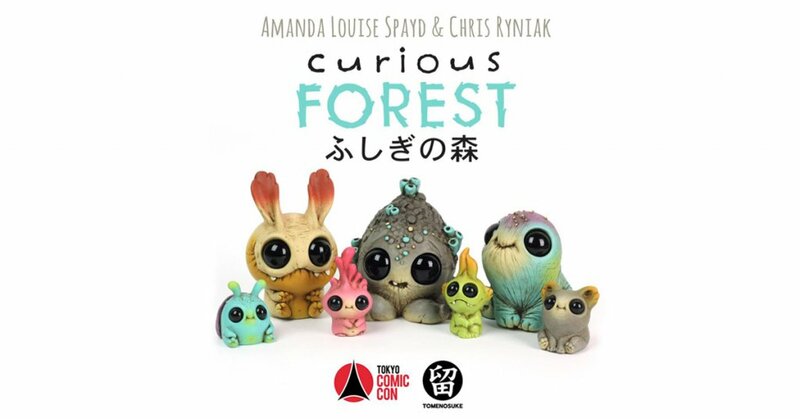 Just hours until the doors open for Tokyo Comic Con 2017, Chris Ryniak & Amanda Louise Spayd ready to launch all their cute critters from the “Curious Forest” series at Tomenosuke booth! “The exhibition will be set up at the Tomenosuke booth at Tokyo Comic-con, Dec 1-3. Online preview and sales to open Dec 5. All of these critters are editions of 10-15 each.” Can Tokyo handle all the cuteness? We hope they can’t as we are selfish and praying for some kinda online release, HA. Heres a little tease of what to expect at Tokyo Comic Con Tomenosuke booth which features One of a kind pieces, plush, resin figures as well as FREE GIFTS! Get ready to squeal…..
FREE GIFTS: “CURIOUS FOREST” post card set for the first 50 each day!